In 1549, during the reign of King Edward VI of England, the first Book of Common Prayer was printed and promulgated. Three years later a second, revised edition appeared and the first one was discarded. One curious feature of the 1552 book was a paragraph that came to be known as the Black Rubric, and on it hangs a tale or two about the perils of this great endeavor in public worship. Although no ordre can be so perfectlye devised, but it may be of some, eyther for theyr ignoraunce and infermitie, or els of malice and ob-stinacie, misconstrued, depraved, and interpreted in a wrong part: And yet because brotherly charitie willeth, that so much as conveniently may be, offences shoulde be taken awaye: therefore we willing to doe the same. Whereas it is ordeyned in the booke of common prayer, in the administracion of the Lord's Supper, that the Communicants knelyng shoulde receyve the holye Communion. whiche thynge beyng well mente, for a sygnificacion of the humble and gratefull acknowledgyng of the benefites of Chryst, geven unto the woorthye receyver, and to avoyde the prophanacion and dysordre, which about the holy Communion myght els ensue: Leste yet the same kneelyng myght be thought or taken otherwyse, we dooe declare that it is not ment thereby, that any adoracion is doone, or oughte to bee doone, eyther unto the Sacramentall bread or wyne there bodily receyved, or unto anye reall and essencial presence there beeyng of Christ's naturall fleshe and bloude. 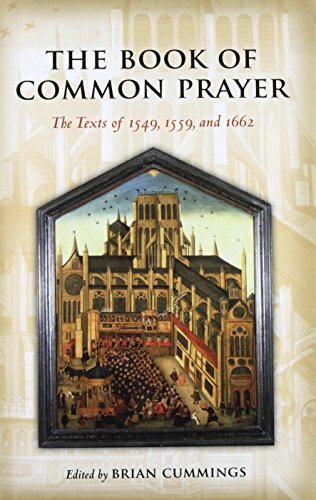 It is hard to imagine a better capsule summary of the difficulties Thomas Cranmer, Archbishop of Canterbury, had landed himself in when he accepted the task of overseeing—and to a considerable extent creating—a single prayer book to be used in churches throughout the realm of England.